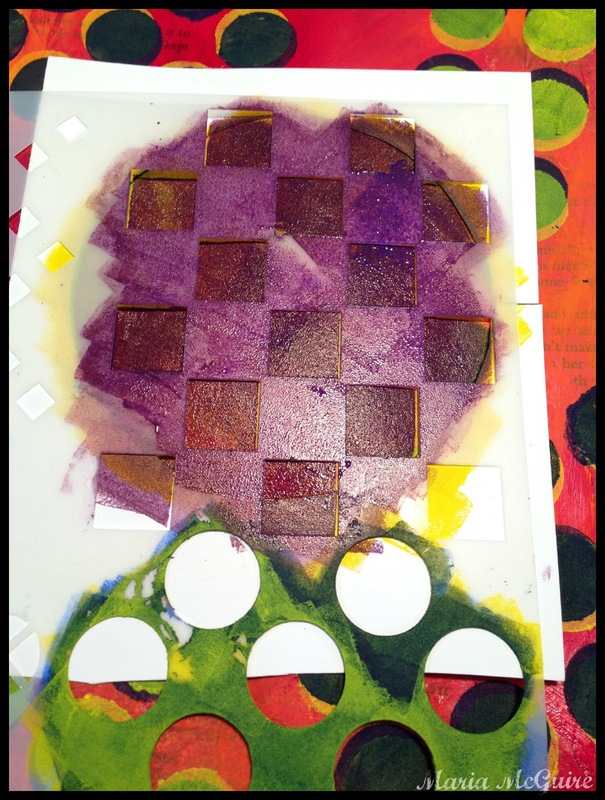 Believe Dream Create with Maria: StencilGirl Talk Blog Hop! If you have arrived from my friend Mary Nasser's Blog you made it!!! You have reached the last STOP on the Hop! Ha ha! I rhymed! If you just happen to be visiting my blog today, you are in for some fun! 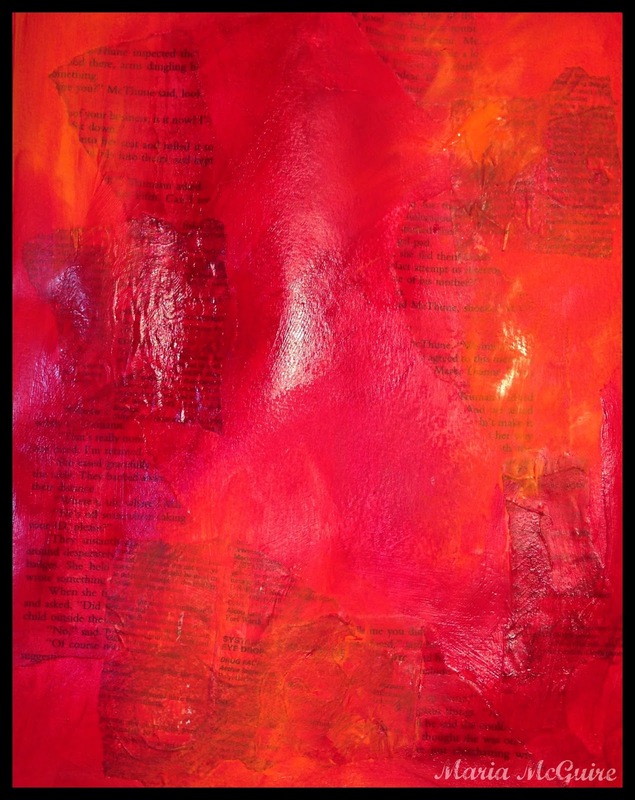 We are having a StencilGirl Blog Hop. When you are done here go on over to StencilGirl Talk to start the hop from the beginning. Today we are featuring a StencilGirl stencil by Andrew Borloz called Crossed Rounds & Squares. Andrew's stencils are amazing and have so many possibilities within each stencil. 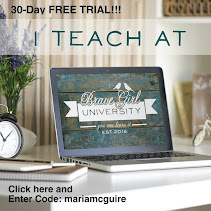 When I sat down to do the project I am posting, it was not going to be my Blog Hop project. It was just going to be "play" to get to know the stencil. Well, one thing led to another and I decided to show you my play time. 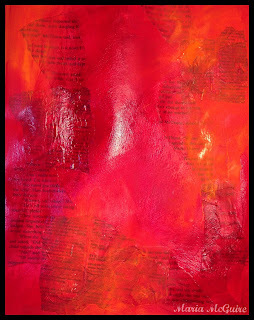 I started with just a page in my journal that had some scraps of book text down and I painted it red. Then I just started playing with the circles on the stencil off setting them as I went. I cut a circle out of a piece of scrap paper and used the negative for a mask. I laid the stencil over the mask so I only would get the pattern only within the circle. 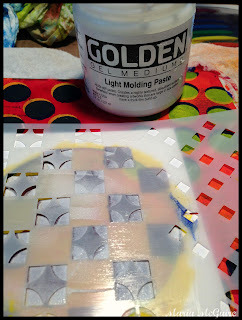 Then I placed the stencil over the mask and used some Light Molding Paste through the stencil. A few more circles, some pen work and my play was complete! There are so many more possibilities I want to try with it. Remember, for every blog you comment on throughout the hop you will increase your chances of winning Andrew's Stencil over at the StencilGirl Talk Blog. The giveaway closes at 11:59PM on Sunday, July 28th. 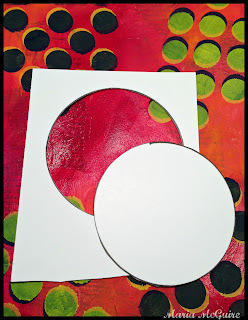 Thanks so much for stopping by our very FIRST StencilGirl Talk Blog Hop! Starting in August StencilGirl Talk will be having TWO Blog Hops a month! I love seeing your play-time! I love the results! Well I think your play time just worked out fab! Thanks for showing the result, a real fun out come, very cool! Thanks for sharing. I'm all hopped out :). Oh wow, you really made these rounds pop out - what an interesting technique to make them look floating! Thanks so much! First time visit and so worth it. I've picked up some new ideas. Thank you for sharing. Cute use of this stencil! This stencil gives so many possibilities! I love 3D effect you've achieved! So Bold! So Awesome! The 3D is amazing! I love it! Simple can be more and I love this! Really like the dimensions and rhythm and movement of this page! Thank you for this blog hop! I've learned so many new ways of using a stencil. Your little play with the stencil is so inspiring and I love your page! Great idea to use the mask! I love the circles.. Yours look 3D like. Very cool. Very 3-D! Looks like you can pick those circles up! Cool. Love the play! You've proven off set is fabulous! I ended up with a bit off set on my pattern I made with this stencil and I was really drawn to it- now I have even more off set things to try with this stencil! This looks great!!! I'm tempted to order the stencil now but will try to wait to see if I win it! Very cool. Love the shadow effect with the circles. I love this " HOP " . In your work I particularly like how you showed us a masking technique &'a technique for texture. Your use of the stencil was great -- full of ideas for myself ( a beginner). Thank you for sharing. People like you help me to grow in my art. Thanks for sharing your creative art piece , have enjoyed this hop. Very cool! I love how the circles just pop off the page! Gorgeous page!! I think "play" pages turn out the best sometimes! Love the bump shadow technique you did. The stencil girl stencils are wonderful and your page has so much depth and layers. Great work with wonderful stencils! The StencilGirl stencils are great and this one looks very versatile, I love the way you inserted the circle. Great use of the stencil as well! What a wonderful giveaway! Great use of the stencil. Lovely page. what can I say? Love it. This has been a wonderful hop! I like your texture work with the stencil the colors pop out and are fun :) I would love to win this stencil. Great page! Love how you offset the circles! I love how you did shadows on the circles and created awesome dimension! Very cool!!!! Love what your play produced!!!! Your project shows the great results possible with this fun stencil. Thanks for sharing! I like the off setting idea very much. Thanks for showing your play time! I like how you have off set the stencil. I'm looking forward to trying that with some of my stencils. Wow, what fun. Your piece looks to me like a crazy fun game board. Play is good. Maria, I love the depth you've created. This would make a fun card! This is amazing - such depth and vivid colors! Thanks for sharing your "play" time with us! I love this stencil and have enjoyed seeing so many different uses for it! What fun you had - I love what you've created! Love how your fun turned into such a great piece! I am loving this sencil! Thanks for sharing and a chance to win. I really like the offset circles - and the black made them look like everything had a shadow. Then to top it off you did a stencil on a stencil - cool - I never tried that before either. Thanks!! Awesome playfulness and awesome stencil. I can see that this stencil is a must have because of it's pattern versatility! For not having a plan this came out wonderful. Love how those off set circles really pop off the page. I'm already looking forward to the next blog hop. Love the unplanned page, sometimes those are the best. This stencil is a lot of fun. Have a great weekend. I love to see the steps in a process. What a great stencil! This looks terrific, amazing the variety of effects, and add in the whole blog hop, there would be endless playing. Enjoyed taking a look, thank you. Wow, Maria. Your circles pop right off the page with the 3-D effect. Very cool. Great colour and amazingly versatile stencil.. I could really use this. Terrific page, love the colours. It is such a great versatile stencil, definitely adding it to my wish list. Love the dimensional look you got with the shadowing. Great blog hop had lots of fun and learned several new techniques. Thank you. wonderful color and pop! really enjoyed the hop. thanks so much! I like the way you play! Thanks for sharing. Great stencil. What good things come from playing around! Love blog hops! So glad to find your site through the hop. Now I want to go play too. How cool! Thanks for the inspiration!!! Just completed the blog hop, Maria, and enjoyed each stop along the way. Many of the StencilGirl DT member were already artsy friends and have enjoyed their successes along the way. I also enjoyed meeting the (to me) newbies. You have put together an amazingly inspirational group of artists to encourage the rest of us! Kudos to Andrew on this new and very versatile stencil and to StencilGirl for finding amazing stencil designers! I love modeling paste, great project. Thanks for being part of the blog hop Maria. what a fun page you made, love the color choices, vibrant! Play!!! 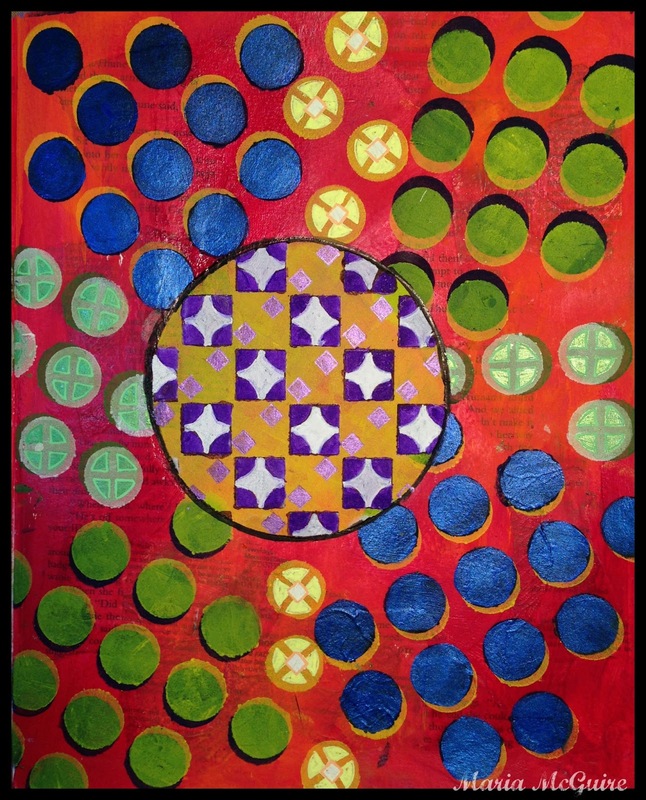 Thank you so much for sharing your work - great colors, and modeling paste? New toy! Haven't used that before! This blog hop has been so. much. fun! Great ideas! I like using Molding paste and stencils too! 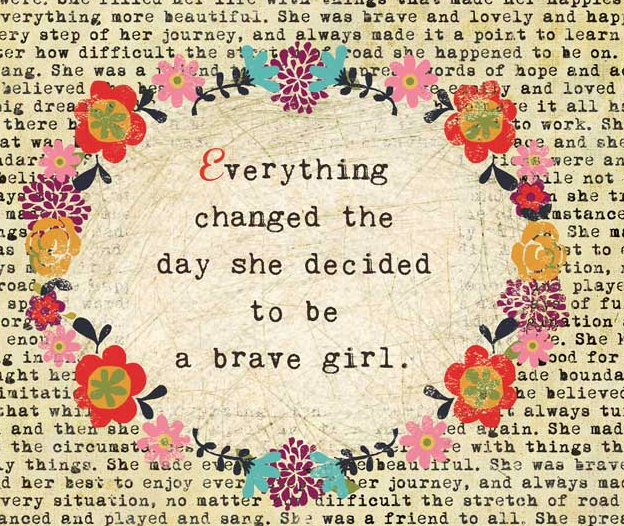 Thanks for sharing--and motivating! You never know when a play time may lead to a great page!! Love the colors you used - they just pop!! Thanks for sharing your process! That stencil is definite must have! Love what you did with the stencil...so graphic and retro! 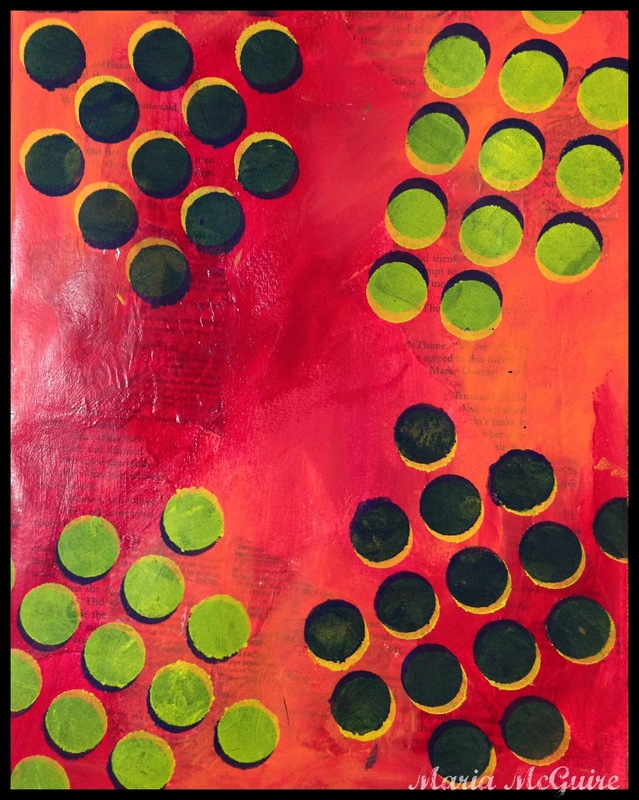 I like the idea of using the stencil a little bit off to show kind of depth to the circles. I like your approach, play play play before jumping in on a finished project. Sometimes you get the best results that way! Fabulous! Love your use of Andrew's stencil, especially that center portion - gorgeous. Thank you for sharing this. It is absolutely wonderful. I love the bright colors.